It's officially Christmas season in London, meaning you need to seriously hot up your wine rack and food cupboards with some eye-catching new products! Also great for gifting. This new collection includes cork inspired accessories and a beautiful clutch box inspired bottle gift set, perfect for Christmas. Made with recycled raspberries left over from making Pinkster, these berries are the perfect accompaniment to your afternoon G&T. Alternative uses: delicious dipped in chocolate, used in a sorbet or mixed in with a pudding! Comes with free Boozy Berries cookbook. Rococo have partnered with the Exmore Caviar Company to create English caviar infused Cornish sea salt, and transformed the grains into subtly salted dark chocolate pearls. The caviar is available from all Rococo stores, and exclusively at Harvey Nichols until the New Year. It is the perfect luxury gift for foodies this Christmas (or year round). For lovers of classic gin and tonic the best option is to incorporate two or three juniper berries, while for a more spiced gin and tonic add a few cardamom pods, slightly crushed, or one of the two peppers, pink or Cubeb pepper. For those seeking a more aromatic and floral combination rose petals and hibiscus flower are perfect and also give natural colour (the gin and tonic gets a beautiful red ruby color). On the contrary, if looking for sweeter flavours, you will need to add a "special touch" with liquorice, star anise or cassia, which also provides an interesting element with citrus aromas and flavours. But if you prefer a citrus drink, the best option is to use a piece of kumquat, the smallest citrus fruit and the only one whose skin is edible. The possibilities are deliciously endless! 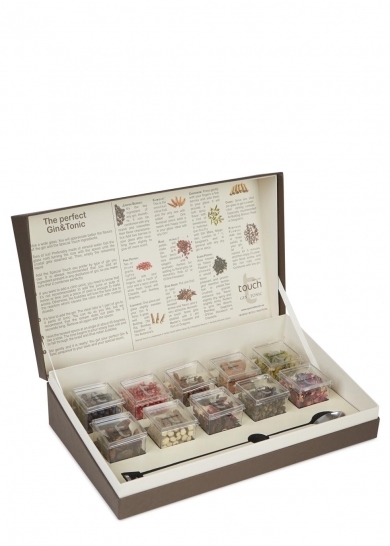 Set includes 10 botanicals. A rather impertinent Christmas creation with beads of caviar from the Maison Petrossian whose aromas of dried fruit are highlighted by an eau de vie of fresh walnuts. The notes of caviar come in ephemeral touches, liberating a few hints of salt allowing the caviar to reveal itself little by little. A very subtle revelation of the taste of caviar, a delicate discovery, full of nuances, for a fabulous taste experience. RRP: £3.20 per piece or assortments from £24.40. Treat your taste buds to Pariya's pashmak rose. Hand woven fairy floss flavoured with natural rose, this unique, magical and delicious Persian treat is certain to intrigue even the most selective tastes. This traditional Christmas pudding is handcrafted in the UK with a blend of spices, vine fruits, brandy and rum, then wrapped up in a classic Liberty London print – a wonderful gift for the festive season. Embrace the spirit of Yuletide with this irresistibly pretty Christmas pudding. Each one is handmade in Devon by Georgie Porgie's Puddings, in collaboration with Liberty London.